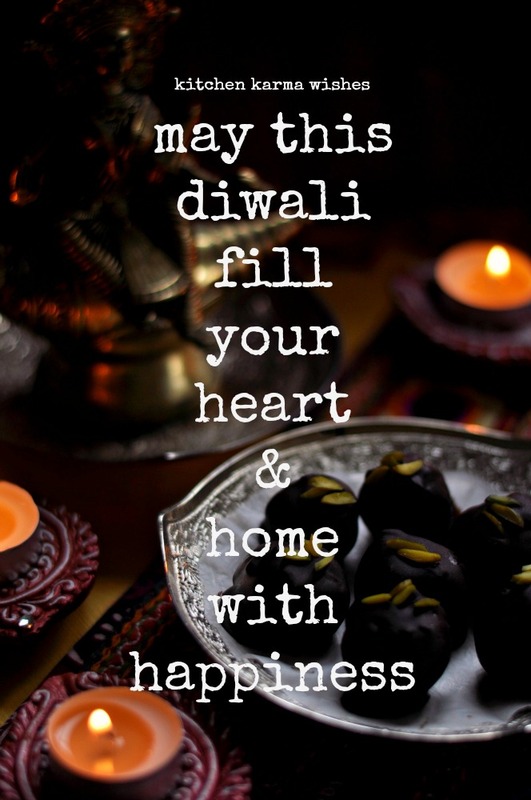 Kitchen Karma wishes all her readers a blessed Diwali. Have a gorgeous time with your family & friends this festive season and stay blessed! End October/early November in my mind equals to the festival of lights. Now that it is getting colder and the days are getting shorter, this festival brings in loads of bright lights, fireworks and good cheer. It's a huge festival all over India, we Bengalis celebrate it a little differently, we worship Goddess Kali on this day and generally go overboard on diyas (traditional Indian clay lamps), good food and noisy fire crackers. We also throw in a ghost or two. The day before Diwali while North India celebrates Choti Diwali, we Bengalis celebrate Bhoot Choturdoshi or the day of the dead. This Bengali Halloween deals with not just any ghost, but really special ones. Hindu Bengalis believe that on this night our ancestors descend down from the heaven to visit us, so in their memory we light 14 diyas and pray for their souls to rest in peace. I remember as a child I used to be terrified of this day and would imagine ghosts lurking about all over the house. Of course no festival is complete without sweets. Specially for Diwali a whole range of traditional sweets are prepared at home, or bought at the local mithai ki dukan (sweet shop). This year I have tried to create a new recipe. 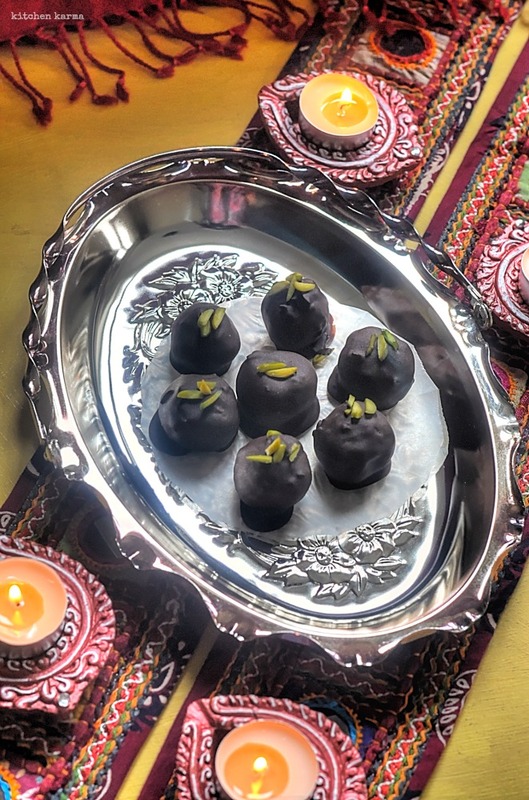 Actually you can't even call it a recipe, what I have done is taken very traditional Bengali narkol naru (coconut ladoos/balls) and turned it into a chocolate truffle. We Bengalis generally make narkol naru at the end of our Durga Pujo. These sweets are easy to make once you have the coconut grated that is. And once made, these sweets stay for a month or so in the fridge. 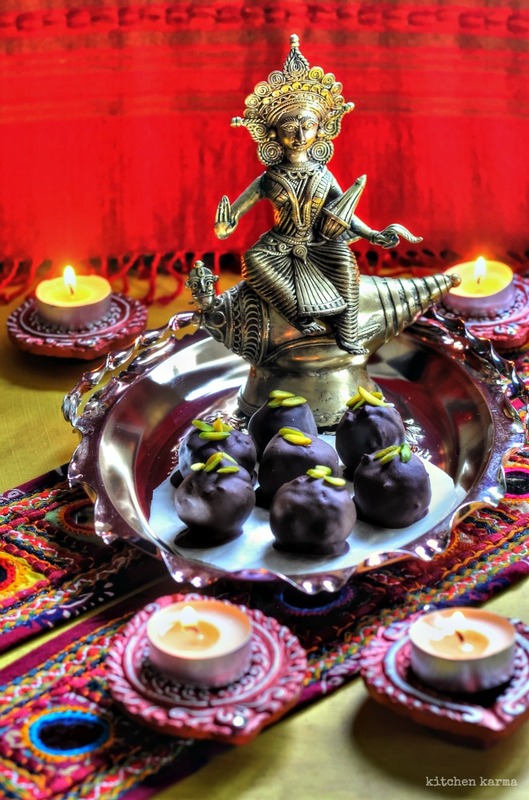 So come Diwali which comes in about three weeks time after Durga Pujo, all you have to do is pop out the remaining narus from the fridge and create the truffles. It's easy peasy and extremely fuss free. You can find the details of how to make narkol narus in this post of mine. Let me share with you how to make the truffles. In a microwave oven safe bowl, break the chocolate into as small pieces as possible. Put the bowl for 30 seconds on high, using a rubber spatula, mix the melted chocolate bits with the still lumpy bits. Put the bowl back in the microwave oven for further 20 seconds, mix well using your spatula again. By this stage your chocolate must have melted and formed a shiny paste, if not heat it for a further 10 seconds and mix well. If you are more comfortable using the traditional ban marie method, use that instead. I am very used to melting chocolate in the microwave oven. Rest the chocolate for the couple of minutes, stir once in between. In a baking tray put a piece of parchment paper, dip the balls in the melted chocolate and gently put on the baking tray. 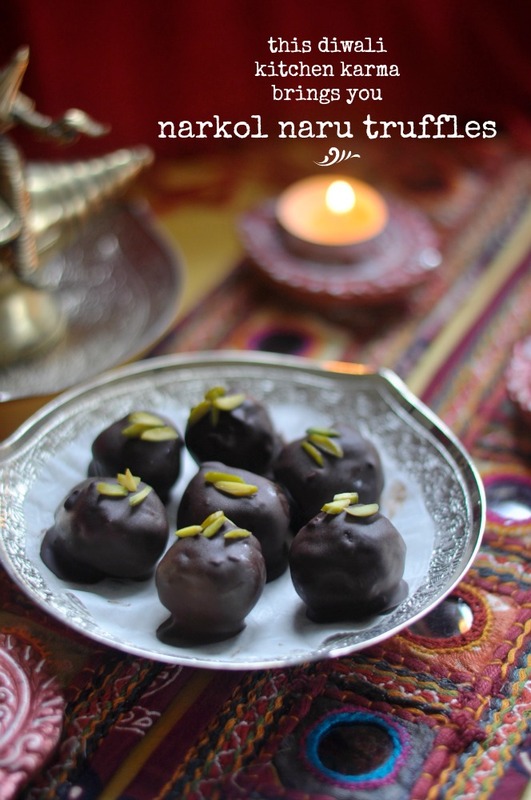 Sprinkle a few slivers of pistachio on top of the setting chocolate on each truffle. Once all the narus have been dipped in chocolate, put the tray in the fridge for at least two hours, I usually keep it in overnight. 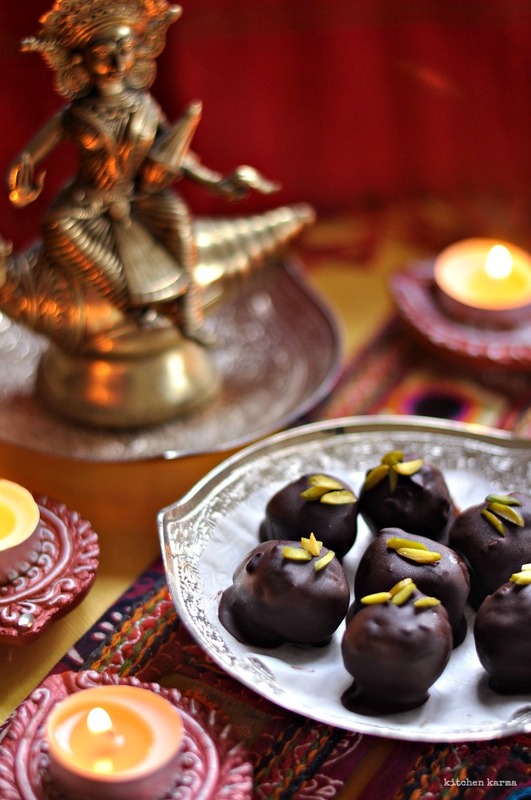 I have been told that these truffles taste pretty much like Indian version of Bounty bars. I don't really know whether to be flattered or be insulted. But any which ways do give this a try and you can decide for yourself. If you enjoyed this post, you may also like my last year's Diwali post where I made spicy pinwheels. Hi Suchi, how you doing? Happy Diwali to you and family.